Looking to take your Poker Night to the next level! Our dealers are professionally trained, dealing Poker tournaments practically ever weekend, not to mention many have just returned home from “The World Series of Poker”! Your Poker night will be played on Casino Grade equipment, dealt with casino grade supplies by the best dealers in the Industry! No more driving to the casino to enjoy Poker with your friends, we will bring the Casino to you! Your guests will not have to take turns dealing, let our professional dealers bring the excitement to you and your guests. Invite your friends over for drinks, food and a great night of Poker! Call us to book your Poker Night! What we do: Sacramento Casino Parties: Bachelor parties, bachelorette parties, birthday parties, casino themed parties, team building events, poker tournaments, fundraisers, corporate parties, holiday parties and just about any event you would like to add the excitement of Vegas fun. Our event planning experts specialize in all types of events, we customize each event, we work with clients who have a guest count of 20 all the way up to thousands, whatever the number of guests we will make your event amazing! We have many years of experience, unparalleled customer service, quality casino equipment and the best dealers in the Industry! Area Serviced: Dealing Exciting Casino Themed Parties & Events to the entire Sacramento Metro Area including the following area cities: Alta, Amador City, Antelope, Applegate, Auburn, Broderick, Brooks, Bryte, Cameron Park, Camino, Capay, Carmichael, Citrus Heights, Clarksburg, Colfax, Coloma, Cool, Courtland, Davis, Diamond Springs, Drytown, Dunnigan, Dutch Flat, El Dorado, El Dorado Hills, El Macero, Elk Grove, Elverta, Emigrant Gap, Esparto, Fair Oaks, Fair Play, Fiddletown, Folsom, Foresthill, Galt, Garden Valley, Georgetown, Gold River, Gold Run, Granite Bay, Greenwood, Grizzly Flats, Guinda, Herald, Hood, Ione, Iowa Hill, Isleton, Jackson, Kelsey, Kit Carson, Knights Landing, Latrobe, Lincoln, Loomis, Lotus, Madison, Martell, Mather, McClellan, Meadow Vista, Mount Aukum, Newcastle, Nicolaus, North Highlands, Orangevale, Pacific House, Penryn, Pilot Hill, Pine Grove, Pioneer, Placerville, Pleasant Grove, Plymouth, Pollock Pines, Rancho Cordova, Rancho Murieta, Rescue, Rio Linda, River Pines, Rocklin, Roseville, Rumsey, Ryde, Sheridan, Shingle Springs, Sloughhouse, Somerset, Sutter Creek, Volcano, Walnut Grove, Weimar, West Sacramento, Wilton, Winters, Woodland, Yolo, Sacramento County Berkley, Napa and San Francisco. 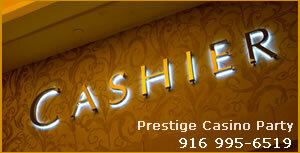 Copyright © Prestige Casino Party of Sacramento | Bartending and Casino Entertainment Inc. | Casino Party Planning, Casino Table Rentals & More! All Rights Reserved. (916) 995-6519.